One of my daily goals is to eat more green vegetables. With the farmer’s market filled with spring vegetables each weekend, this is pretty easy to do. I am always grabbing fresh asparagus, kale and spinach when we go on Saturday mornings. Salads are my go to lunches because they are quick, delicious and easy to take to the office with me. 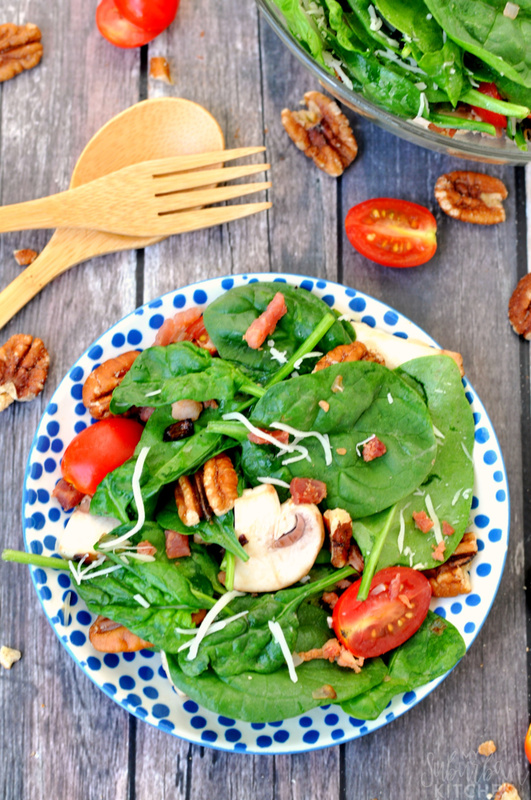 My current favorite is a bacon spinach salad. 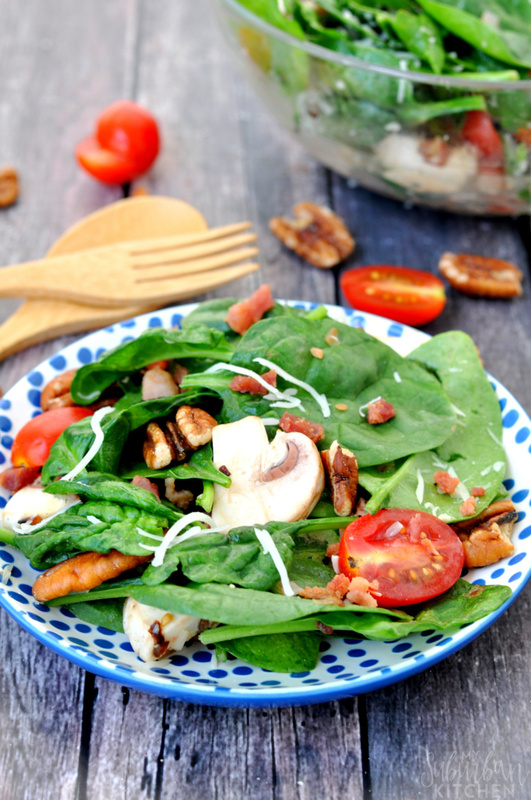 This salad is extremely versatile so it is easy to use as a way to clean out the fridge before trash day. I am always changing up the ingredients I add to it based on what I have available. Sometimes I skip the Swiss cheese and do a goat cheese instead. The dressing is what totally makes this salad though so don’t make any changes to it. Cut bacon into pieces. Heat large skillet over medium heat. Add bacon and cook until browned and crisp. Remove bacon and reserve bacon grease. Whisk in mustard and red wine vinegar. 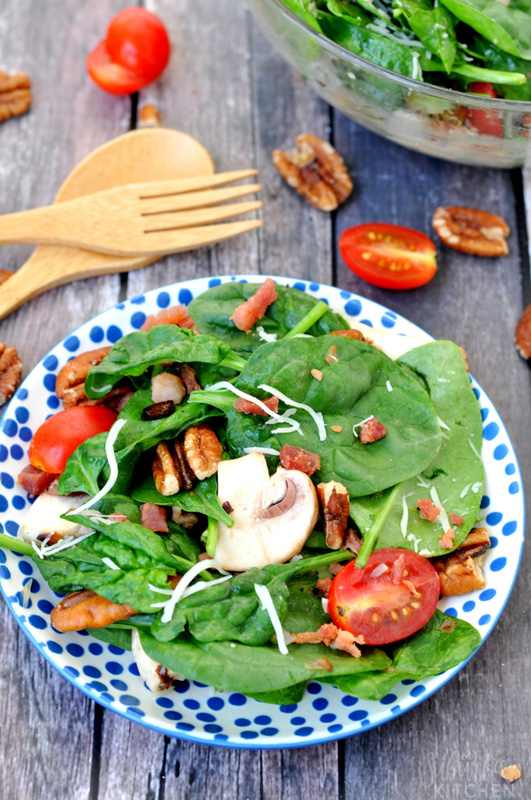 In a large bowl, combine spinach, tomatoes, mushrooms, Swiss cheese and pecans. Toss with dressing just before serving. The residual warmth of the dressing from being in the pan wilts the spinach perfectly. With the combination of bacon and the dressing, I can even convince Mathlete to eat this salad. What are your favorite salads for spring? Do you try to add extra vegetables into your diet once the farmer’s markets open? If you want even more delicious ways to enjoy spring green vegetables, be sure to check out this awesome list of recipes featuring everything from asparagus to spinach! Looks refreshing!! Thanks for sharing on the What’s for Dinner party!